The train from Bangkok to Nong Khai was an eye-opener. We were in Ist Class Soft Sleeper – the best – apparently. We would probably consider them 6th Class in Oz! Imagine a carriage with ex-centric wheels (for you kids – the wheels are not round), so you rise up and down, at the same time the rails aren’t level and the train often appears to be tipping over. A strange motion. Interesting journey as the jungle gave way to light trees, dry rice paddies and all types of rail-side shacks. Also many new stations under construction for you happy travellers in the future. 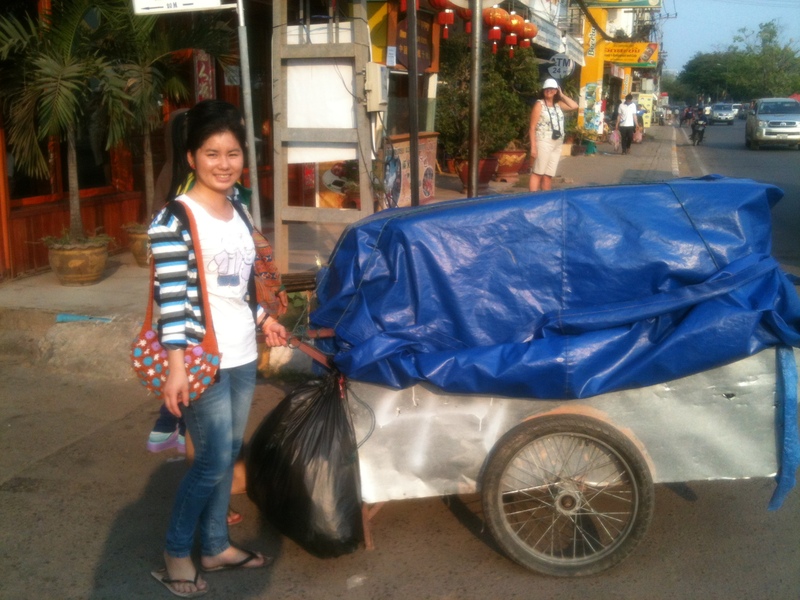 Vientiane is a quaint walking city. Great ambiance, very small. Happy people – clubs, drinking spots, coffee shops and the food…oh the food. Pad Thais, Tom-Yum and many others. Most meals a dollar in the street, two dollars in a cafe and seven dollars in good hotels. Two pints of Laos beer, three meals, rice, ice cream- $15. Cigarettes – AUS50c a packet. ..House on the front where we are, fronting the Mekong River AUS$3m. 10Km out, AUS$11,000. As a waitress earns about AUS$100 a month, you guessed it, it is the hotels chains who are buying up. Money is coming into Laos but at present, we find it as relaxing as Bali. Street View to Mekong River – almost dry. .Heaps of Wats – they are their religious temples and buildings – heavily guilded and painted in bright red, blues etc. Yesterday also popped into the Laos museum. Lots of archaeological digs and artefacts but comprehensive coverage of the wars in Laos – from invasion from Siam (now Thailand) centuries ago to invasion by other neighbours and the wars with the USA (Vietnam War) and finally independence from China. Naturally very biased but also very interesting. Lots of night markets – here are the girls setting up – about half a kilometer long at night when it is cool. And lastly, just for our hot ‘n spicy Brad, put Vientiane on your bucket list – worth three days on the way to somewhere and do they love their chillies? Not quite the last. At the Best Western Vientiane Hotel we had the oldest trick in the book played on us. When we go abroad Chis never uses her mobile phone. We take a spare. We also never put anything in drawers in case we forget something. When we finally leave a hotel we pack and check EVERYTHING. Well would you believe it? Chris’s mobile leapt out of her handbag and landed under the 600mm x 600mm cushion on the sofa – not down the side, but in the middle. Then, guess what, her favourite blouse also flew out of her case, folded itself and landed in a drawer! Management just smiled and were not even remotely concerned. A sad indictment.